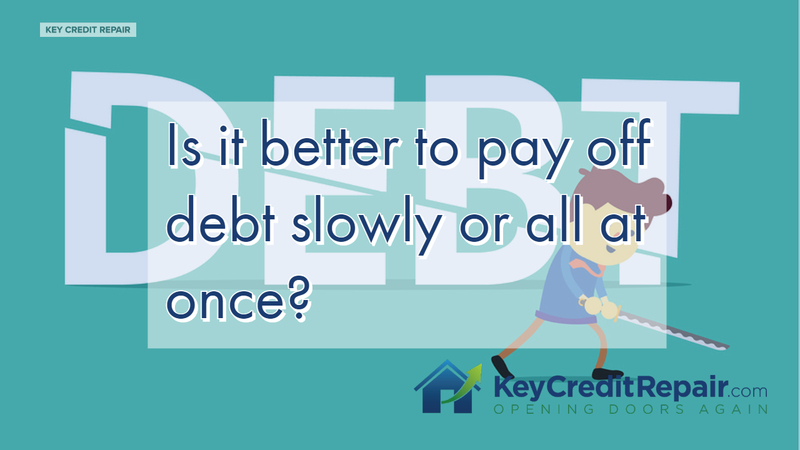 Home / Credit Repair Blog / Is it better to pay off debt slowly or all at once? 00:13 Okay. Real simple, guys. It’s just the numbers. If you’ve got the money in the bank, it’s earning .0015%, like literally nothing. Okay? Your money, uh, if you compare it to, or if you compare the interest rate you’re getting from the bank to the inflation, your money’s actually losing value in the bank. Your credit card company’s charging you 28%. Right? 00:36 So, your money’s sitting in the bank is costing you 28%. Okay? If you’re nursing credit card debt. So, should you pay it off at once if you have the money? Absolutely. Hell, yes. You better do it. Um, you will be fine if you want to leave $100.00 in your pocket just in case something happens between now and the next paycheck. Rock and roll, but pay off the debt. Don’t nurse it. It’s not your friend. Credit card companies don’t like you. They’re trying to get paid by you. Okay. So, get away from debt. If you need to pay it slowly, then what you want to do is start with the smallest debt, pay the minimums on everything else. Pay that sucker off and move your way up the list. It’s called the Snowball Effect, but we can talk about that another time. 01:16 Have a great day, guys.